Designed to be compact, lightweight and easy to transport. The Comfort Space 7 unit can accommodate up to 7 people with 640 litres of dedicated storage provision for personal belongings. The single axle design makes it easy to transport and meets all of the HSE welfare on-site standard. Power is provided by the integrated silenced 7KVA diesel generator which supplies three electrical specifications, Standard, Eco+ and Hybrid. 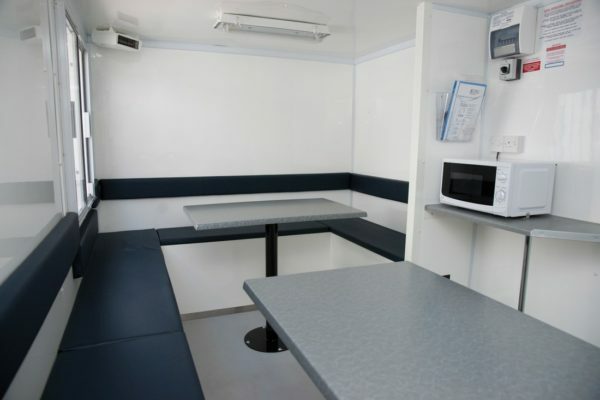 Rounded table, bench seating with dedicated storage under, dedicated wall storage compartments, 2 kw ceiling mounted heater, catering grade stainless steel worktops, microwave, forearm sink with hogwash, towel and soap dispensers, window with security shutter. Recirculating chemical toilet with forearm sink and hotwash, high-security skylight and PIR LED light.